Meridian- Meeting of Curiousity and Technology - Invento Robotics: Robots for customer engagement. Mitra has been majorly associated with corporate events in various verticals , be it insurance companies, IT sectors or entertainment groups but recently we have been going biggie over school events.We were associated with Metamorphosis for the Schoolpreneur summit as mentioned in our previous blog. Mitra was one of the key guests for the Meridian School. 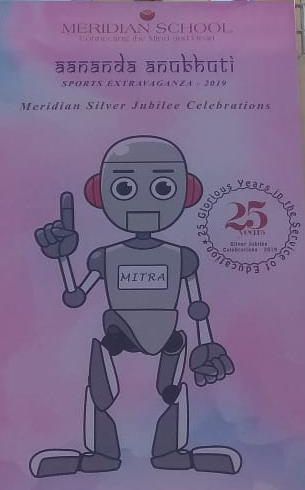 Mitra declared the Silver Jubilee sports extravaganza 2018-2019 open. Apart from being a gateway for school children to upcoming technologies,Mitra was also an inspiration to the parents visiting the event. We had the Principal and Vice Principal of Meridian school defining their experience of having Mitra hosting the event.